Anyway, somebody emailed me looking for the reasoning behind her statement that 99.9% of all dogs will never attack anybody. I asked her how she came up with the figure and in her usual gracious way, she responded in some detail. What follows is the explanation. I hope you enjoy it and will pass it on. Back in 1999 or 2000, researcher Marjorie Darby looked at news stories about dog bites, and separated them into what were reported to be rather simple bites (ie, 'a pit bull looked at me') and those reported as being more serious (ie resulting in more serious injuries - needing stitches, hospitalization, surgery, etc.). Ms Darby had a good contact at Toronto Humane Society at the time, who moved on to Toronto Animal Services as an enforcement/investigation agent. When queried about the number of dog bite cases, and the relative number of those that were more serious than a simple bite she confirmed the general ratio (nearly all reports were simple bites with minor injuries, only a tiny number could be called "serious".) 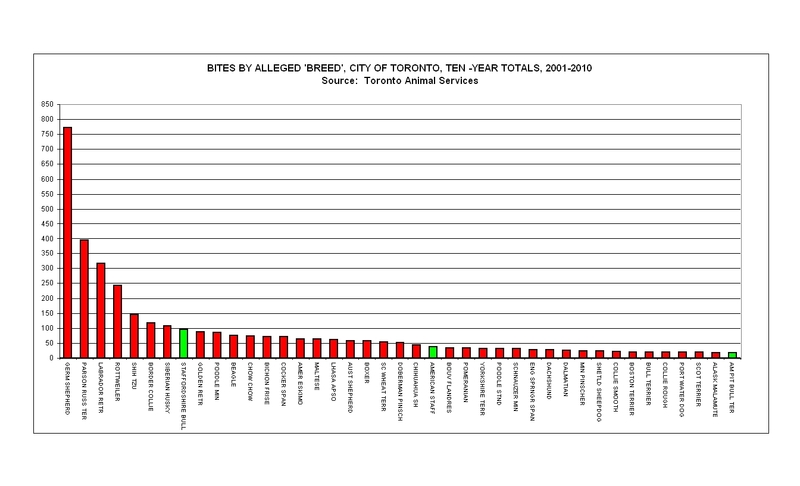 Based on all of this information, it became clear that there were (and are) very few actual serious dog bite cases in Canada. There were maybe a dozen serious dog bite cases from across Canada in the year studied. To err on the side of caution, Darby decided to assume that the real number of "attack" cases was double, triple or more compared with what she had learned, since she didn't have (and no one has) access to the precise number of incidents. As Janis Bradley says, nobody is counting dog bites, you have to search hospital records for information - which only represent a portion of all bites. Darby knew that many serious dog bite cases don't end up in the media because of breed bias. Still, she could only confirm maybe a dozen dog "attack" cases in Canada, nationwide, over a period of about a year. Not having access to every single dog attack case, she tried to come up with a reasonable percentage to use in discussions about dog attacks. With a dog population somewhere around 5,000,000 in Canada, 0.1% is 5,000. That would mean that, in any given year, there would be 5,000 serious dog attacks, if just 0.1% of dogs were involved. The process is the same for the U.S. but we have better estimates about the number of 'pit bulls' there than here in Canada. There are estimated to be about 65,000,000 dogs in the U.S.* 0.1% is 65,000. Meaning, in any given year, if 0.1% of American dogs "attacked", there'd be 65,000 attacks, or 178 serious dog attacks every, single day of the year. Not just bites, mind you, but "attacks". Hospital data vary greatly, but 800,000 dog bites treated medically is at the extreme high end, and most of the data around 1999-2000 suggested the figure was more like 300,000 or 400,000. Still, that doesn't tell us anything about severity, just that medical attention was sought. There are estimated to be about 9 million 'pit bulls' in the U.S. Darby used a very conservative estimate of 5,000,000 to calculate what 0.1% of 'pit bulls' attacking would mean. It comes out to about 14 serious attacks, every single day of the year. Every day that went by where there weren't 14 serious 'pit bull' attacks somewhere in the U.S., that would mean that even fewer than 0.1% of all 'pit bulls' were involved in a serious biting incident. Given that 'pit bull' incidents are reported by the media at such a high rate, I would be surprised to learn than so many serious 'pit bull' attacks are being ignored by them, if it is to be alleged that more than 0.1% of 'pit bulls' are attacking people. You can do the 10-year lifespan calculations on an estimated U.S. 'pit bull' population anywhere from 5 million to 9 million individuals. None of the calculations suggest anything other than that 99.9% of dogs, or even 99.9% of all 'pit bulls' will NOT be involved in an attack at any time in their lives. "When it comes to ‘pit bulls’, fewer than 0.1% will ever be involved in an attack at any time in their lives, and even conservative estimates suggest at least 99.99998% of all ‘pit bulls’ have not killed anyone." When Darby was conducting this research in 1999-2003, there had been approximately 80 human fatalities attributed to 'pit bull' attacks in the previous 30 years or so in the U.S. 9,000,000 'pit bulls' (assuming a 10 year lifespan) would easily translate into 27,000,000 'pit bulls' that existed during that 30-year period. 80 fatalities out of 27,000,000 is 0.0002%. While that seems incorrect to Darby, since she recalls at some point, a few years ago confirming it was 4 zeros after the decimal, rather than 3, that's what this calculation concludes. Nonetheless, we're still talking about, at most, 0.0002% of 'pit bulls' having killed a person in the U.S. That leaves 99.9998% innocent of the allegation they're all killers. When we're talking about such small numbers, Darby would still have no problem saying, "Frankly, I don't know what relevant information is gleaned from the acts of less than 0.0002% of the population. Whatever it may be, it certainly doesn't conclude anything about the rest. Again I would also reiterate, if any breed were genetically-programmed to attack, certainly more than 0.1% of them would". *According to the most recent US census results, there are now an estimated 72 million dogs in the United States. KC has an excellent article today about how you can't legislate against ignorance. I'd like to see this piece in a major newspaper - what are the chances of that happening? I'm not sure how we got here. But we need to change it...quickly. At some point, in this country, we decided that we thought it was possible to punish people into being responsible dog owners. We can't. And the idea that we can has failed us miserably. It has failed the dogs. It has failed owners. And it has failed children. As Brent points out, taking people's dogs does not solve the problems created through lack of education. Obvious? Yes, but legislators at all levels of government appear to be missing that simple point. Folks, we can't continue to go through this conversation thinking we can legislate responsible dog ownership. Sure, we can put laws in place that show what we want people to do -- but we must follow the laws up with real conversations about responsible dog ownership practices. Calgary, Alberta, has, statistically, one of the most successful animal controls in North America. One thing that makes Calgary's animal control laws work is that they have the laws -- but they don't use the laws to punish the owners that violate them. They use the laws to create conversations to educate owners on responsible dog ownership. Most people want to be good dog owners -- and if you show them how, they will do it. Thanks, Brent, for a great post about the real problem out there. There's a cure for ignorance. Maybe it's time to get busy with that task instead of using punitive measures, passing the buck and turning innocent animals into scapegoats through panic policy-making that is destined to fail. The City of Côte St. Luc will be introducing a new bylaw to "regulate" the ownership of certain dog breeds that have acquired a reputation for aggressive behavior. In an interview, mayor Anthony Housefather said Côte St. Luc will be referring to certain specific breeds in its bylaw. "We will be targeting breeds," he said, "because we believe that there have been sufficient incidents in communities surrounding us that we've read about to warrant a concern. "There are municipalities across North America that have pro-actively adopted this bylaw and we feel that there are certain breeds that really need to be regulated. And we also noted that it would be unfair to simply ban those breeds. Two years ago, the province of Ontario made it illegal to import or transport Pit Bulls through its territory. While Pit Bulls owned prior to that are still allowed, they must be muzzled and tethered on a leash no longer than 1.8 metres. Since 1990, the City of Winnipeg, Man. has had a by-law banning Pit Bulls. The councillors of Cote St Luc are in need of some education around this issue. Here's a link to the page containing their names and addresses. While it's nice if you can write in French I suspect a letter written in English will not be rejected, based on the surnames of the Councillors. First, they need to be made aware that 'pit bulls' are not a breed at all and that unrelated breeds and mongrels can't possibly display the same traits. Furthermore, planning to restrict completely different kinds of dogs then adding mutts that remotely resemble them does not indicate that they have a 'breed' problem, but rather a bylaw enforcement problem. Then, they should know that contrary to popular mythology, even when an umbrella term is used, so-called 'pit bulls' are not the most dangerous dogs in Canada in terms of either bites or fatal attacks (entire paper is available free at the link). Ontario banned 'pit bulls' in 2005, which was four years ago, not two. The fact that other places keep referencing Ontario is just one more reason why we must get this discriminatory, useless piece of legislation overturned. It is costing each municipality in Ontario between $65,000 and $100,000 to prosecute a 'pit bull' ownership case (which is why owners should go to court every single time). It is costing the Ontario government - which means taxpayers - millions of dollars to defend the law through the court system. Add in kenneling costs, animal services time, equipment, blah blah blah and it all adds up to a colosssal waste of money that achieves nothing useful if your goal is to prevent negligent dog ownership. In fact, in view of the bad PR and the fact that public support for this kind of program is usually tepid at best, it's a mystery why anybody wants to go down this road when there's such a great, made-in-Canada solution available that is entirely user-funded. That's right, it doesn't cost taxpayers a cent once it's up and running. The City of Winnipeg, like all cities that have mistakenly brought in 'pit bull' bans, found there was a sharp increase in dog bites shortly after the law came into effect. Here are their bite stats, which are not current, but cover both the pre- and post-ban period. The numbers seem to contradict the statements of then-Attorney General Bryant about how effective their ban really was. Go figure. 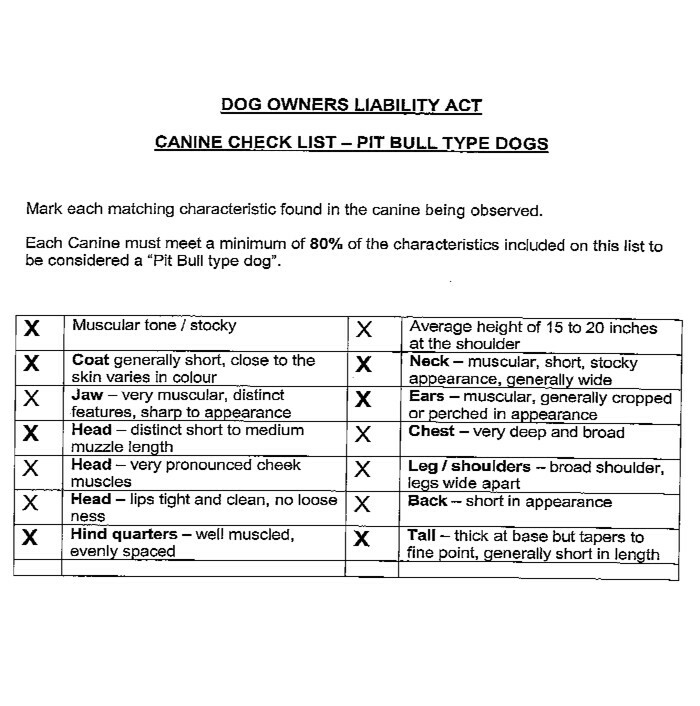 Note that so-called 'pit bulls' weren't actually leading the stats before the ban which is again, very typical. I can't help but wonder who has been whispering in their ears but it's probably the usual suspects from Denver, DC and Toronto among others. I guess I have to write these people a letter. If measures are considered useful, they should be applied to all dog owners across the board.
' PIT BULLS ' HARD TO TRAIN AS K9 OFFICERS? According to K9 officers in Chicago, whose unit uses the traditional German Shepherd Dogs and even has a Bloodhound on staff, 'pit bulls' are a problem for the force. A pit bull named Elliot Ness is anything but untouchable. Loving and friendly, these traits keep most pit bulls from being good police dogs. "The main problem we're finding with pit bulls is that they're too darn nice. All they want to do is just sit at your feet or crawl in your lap. They're very nice dogs," said Deborah Thedos, Cook County K9 Unit. Police officers main contact with pit bulls is when they break up dog fighting rings. When encountering these dogs they found that they were anything but vicious. "We knew from the get-go that these dogs, they aren't made this way," said Sheriff Tom Dart, Cook County. For Elliot Ness's partner the pit bull is much more than just a dog. "He's my best friend. He's my friend. He's my baby and he knows it," said Thedos . Here's the whole item, with accompanying video. Thanks to ABC News for running a true story about 'pit bulls'.